The Caribbean region is filled with cultural hallmarks that link most islands clearly to the territory. Not just because it's part of the European Union as a department of France, but because the vibrant blend of French, African and Arawak influences rolls into a distinct culture that begs for discovery. Exploring the varied terrain of mountains, volcanoes and beaches, I realized that Martinique isn’t just different on the surface but the French joie de vive that informs the lifestyle makes it unlike any other Caribbean island. I was immediately struck by the differences when I sat down for a typical breakfast at the Martinique Club Med. Instead of the standard, hardy West Indian fare of fish, plantains and porridge, I was greeted with pain au beurre delicately braided, heart-shaped butter bread. A thick cup of local chocolat for dunking and drinking rounded out the meal. It turned out to be the perfect introduction to the island’s culinary sophistication. 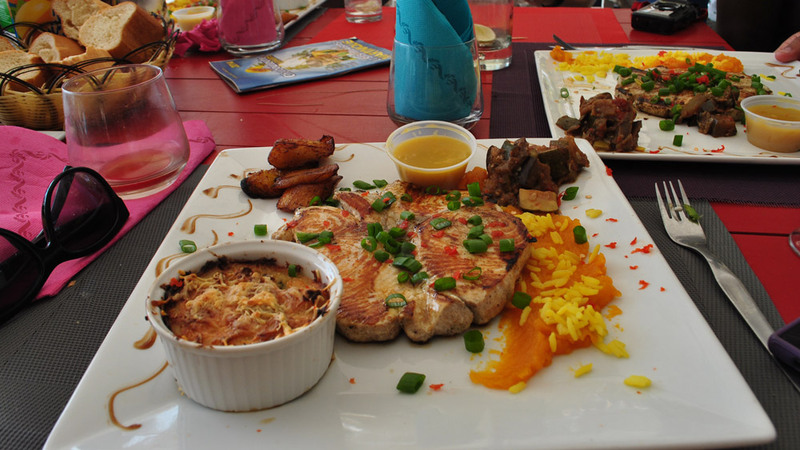 Visiting the celebrated beach café, Le Peitibonum, underscored the exceptional quality of Martincican fare. Tucked into a corner of the pearly sands of Le Carbet beach, Le Petitbonum looks like any other beach shack, with rubber chaises and clusters of tables and chairs under an awning. My first glimpse of the chef, Guy Ferdinand, aka as Chef Hotpants, was my first clue that this was not the typical beach eats experience. With sun-streaked curly hair, a crimson chef’s coat and teeny shorts, Guy unveiled five courses of gourmet dishes. Starting with accras, codfish fritters that pair well with the bracing national cocktail, ti-punch, and moving from fresh tuna and mango ceviche to grilled lionfish with fried plantains and baked christophene, the blend of Caribbean cooking with a French sensibility was sublime. At Balata Botanical Gardens, the inspiration for Madinina, the Carib Indian name for the island which means “isle of flowers,” comes to life. Fields of tropical plants and flowers, including heliconias, bromeliads and orchids surround a traditional 19th century Creole house. The garden boasts 3,000 varieties of plants as well as a stunning canopy path that showcases panoramic views of the five volcanic peaks of the Pitons Du Carbet. 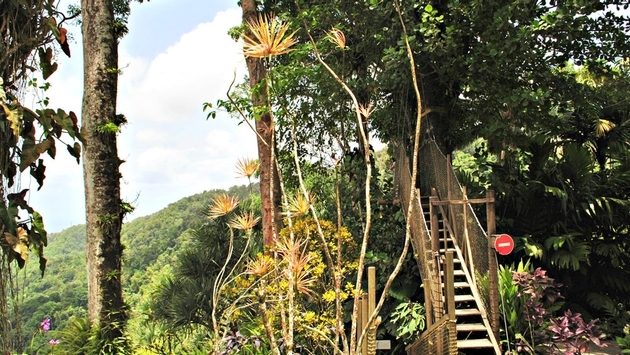 Suspended from a series of mahogany trees, the canopy walk supplies a great perspective of the island’s natural beauty. Gazing out from the path, I felt embraced by the tropical scenery. Besides natural beauty, Martinique is also noted as the birthplace of its most famous daughter; Napoleon’s first wife, Josephine Bonaparte. Young Josephine grew up in the village of Trois Illets but her namesake pool is located in the crystalline bay of Le Francois, on the Atlantic side of the island. A shallow opening in the middle of the sea encircled by coral and sand banks, Josephine’s Bath was according to local legend, a favorite swim spot for the future empress of France. Today, it retains a serene loveliness and attracts visitors eager to dip into the magic of Martinique.